While most psychologists call mind wandering a detrimental “failure of executive control," a new study led by Paul Seli suggests that it's not always harmful. It’s a common experience for most students. You’re sitting in a lecture that covers material you already know, and before long your mind drifts and you become occupied with thoughts of what you’ll do over the weekend, or what you should make for dinner, or whether you should ask out the person sitting in the front row. While most of the psychological literature has painted such mind wandering as a detrimental “failure of executive control” or a “dysfunctional cognitive state,” a new study led by Paul Seli, a Banting Postdoctoral Fellow working in the lab of Dan Schacter, suggests that in some cases there’s no harm in allowing the mind to wander. The first-of-its-kind study showed that, when performing a task that didn’t demand constant attention, people were able to strategically allow their minds to wander without an impact on task performance. The study is described in a paper published in Psychological Science. As an example, Seli cited studies that have used a now-common sustained-attention task for which the participants had to press a button each time they saw certain numbers on a screen (like the digits 1‒2 and 4‒9) and to withhold responding to a target digit (say, the digit 3). “Because the series of digits is randomly presented, people don’t know when the 3 is going to be presented,” he said. “So if they want to perform well on the task, they must constantly pay attention to all the digits, because any one of them could be a target. To explore whether it was possible for people to mind wander strategically, Seli designed a new kind of task for participants. 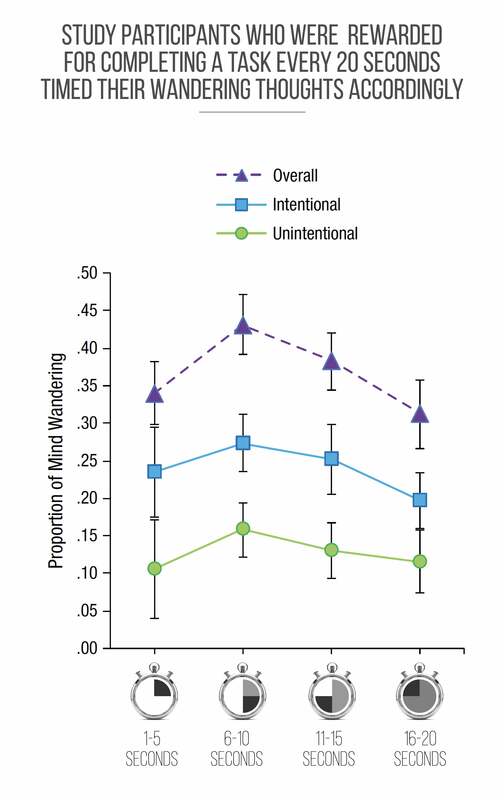 To assess participants’ rates of mind wandering throughout the clock task, Seli and colleagues intermittently presented “thought probes,” which are questions that interrupt the task, and asked participants if they were focused on the task or engaged in mind wandering. To determine whether people did strategically mind wander, the researchers divided the clock’s face into quadrants and examined rates of mind wandering caught by probes in each quadrant. In the first quadrant, which covered the five-second period following each critical event, they found that participants reported mind wandering about 33 percent of the time. Over the second and third quadrants, which covered the next 10 seconds, participants’ focus on the task waned, and they reported mind wandering about half the time. But as the clock hand began to finish its revolution, participants returned their attention to the task, and their reports of mind wandering dropped. What’s more is that in analyzing participants’ accuracy on the clock task, how much their minds wandered did not affect how well they performed on the task, although Seli and colleagues found variation in how much or little people mind wandered throughout the task. While the study offers evidence that people can, in fact, strategically mind wander without incurring costs, Seli said it also raises interesting questions about how universal that ability may be. Ultimately, Seli said, the study points to the need for context when it comes to understanding and evaluating the risks associated with mind wandering. “If you’re completing a task that affords you the opportunity to mind wander, like writing an email or riding a bicycle … then mind wandering is likely not going to hurt your performance, and it may even be functional insofar as it might allow you to engage in beneficial processes such as problem-solving or creative thinking,” he said. “But there are certainly some attentionally demanding tasks, like those performed by air-traffic controllers or train operators, for which we don’t want to be advising people to just go ahead and mind wander. “The vast majority of research has painted a rather bleak picture of mind wandering because much of this research has used tasks that constantly demand people’s attention.” He continued, “Of course, if people are completing a task that constantly demands their attention, then by definition mind wandering during that task is going to hurt their performance. And this is a finding that we’ve seen time and time again in the literature. Ellen Johnson Sirleaf discusses her experiences as president of Liberia in a session of the Harvard Ministerial Leadership Program.